Like all worlds orbiting suns, our planet Earth casts a shadow. Here are some times to look for it. 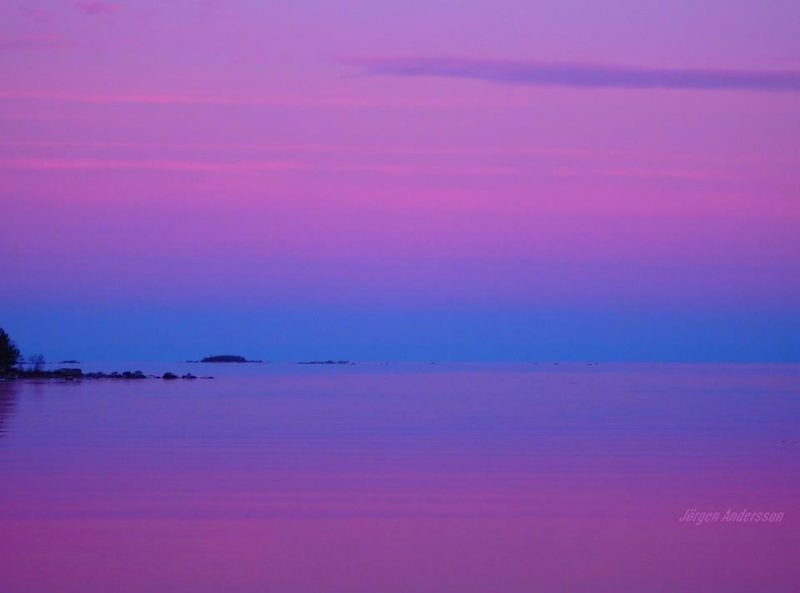 Earth’s shadow is the dark blue line above the horizon in this photo taken in January 2018 by Jörgen Andersson in Sweden. Like all worlds orbiting a sun, Earth casts a shadow. Earth’s shadow extends about 870,000 miles (1.4 million km) into space. You might not realize it, but, from Earth’s surface, you can see the shadow. In fact, it’s easy to see, and you’ve probably already seen it, many times, as day changes to night. That’s because night itself is a shadow. When night falls, you’re standing within the shadow of Earth. 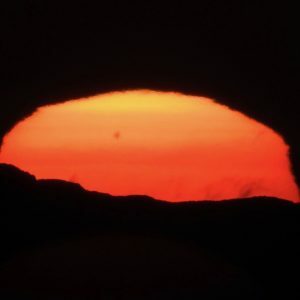 The best time to watch for Earth’s shadow is when it’s creeping up on your part of Earth … Like all shadows, the shadow of Earth is always opposite the sun. So you’ll want to look eastward after sunset for the shadow (or westward before sunrise). View larger. | Night falls when the part of Earth you’re standing on enters Earth’s shadow. Image via NASA. The shadow is a deep blue-grey, and it’s darker than the blue of the twilight sky. The pink band above the shadow is called the Belt of Venus. The shadow of the Earth is big. You might have to turn your head this way and that – along the arc of the horizon opposite the sun – to see the whole thing. And, just so you’ll recognize it more easily, remember that the shadow is curved, in exactly the same way that the whole Earth is curved. And, once you spot it, don’t go back inside just yet. Wait awhile, and watch Earth’s shadow ascending in the east at exactly the same rate that the sun is setting below your western horizon. 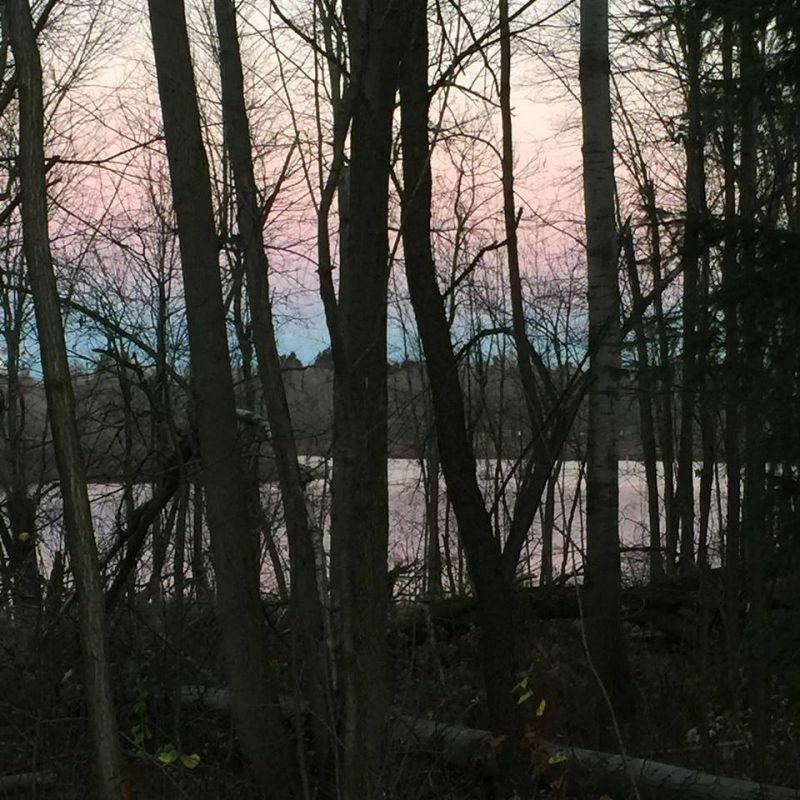 Earth’s shadow is the blue line near the horizon, behind the bare trees, in this November 2017 photo by Alice McClure. The pink band above the shadow is called the Belt of Venus. You don’t have to be in a country location to see Earth’s shadow. 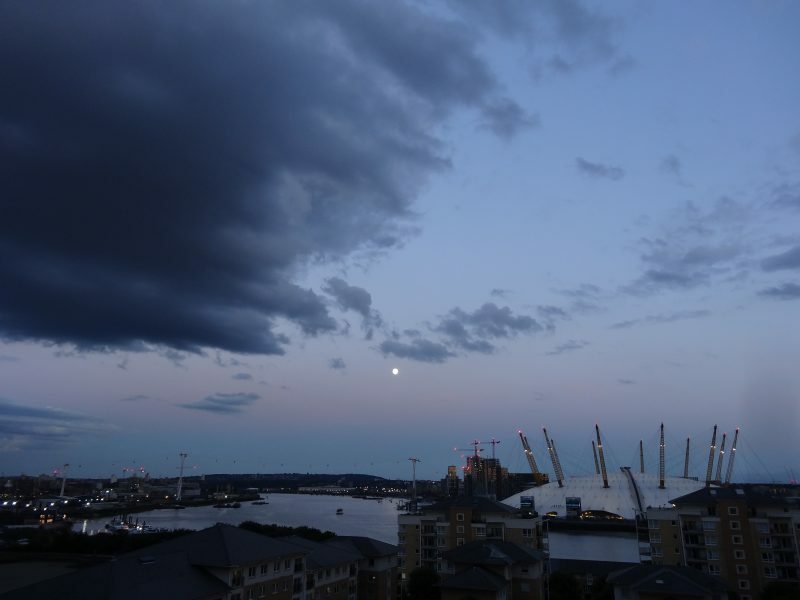 Sucheta Wipat caught the Earth’s shadow and Belt of Venus on a cloudy evening in London in August 2017. Earth’s shadow extends so far into space that it can touch the moon. That’s what a lunar eclipse is. It’s the moon within Earth’s shadow. When the sun, the Earth and the moon are aligned in space (nearly or perfectly), with the Earth in between the sun and moon, then Earth’s shadow falls on the moon’s face. 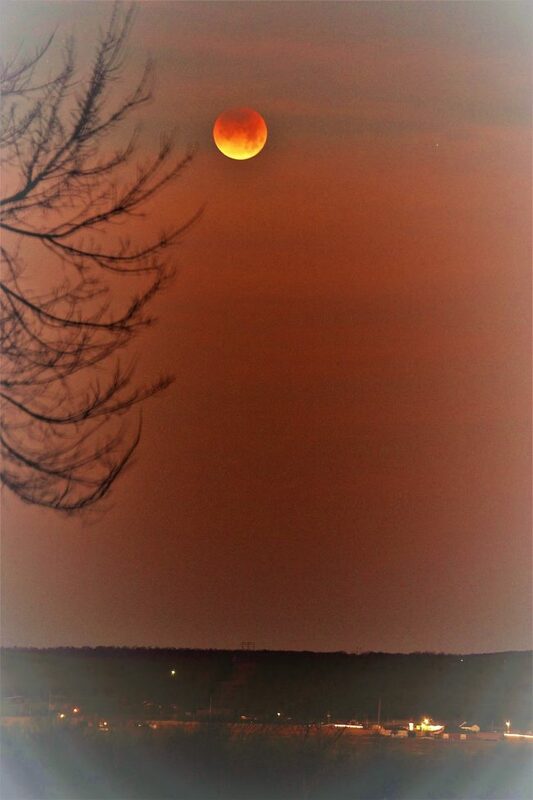 Then people on Earth see the shadow gradually turn a bright full moon dark in a lunar eclipse. 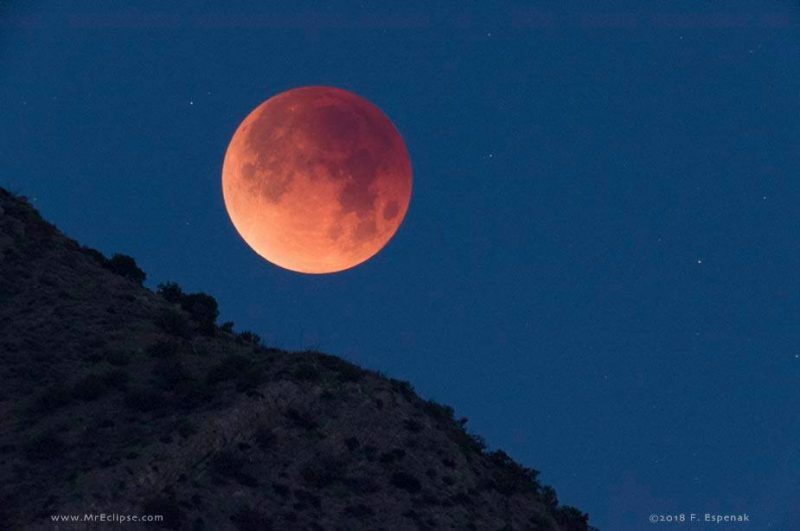 As seen from Earth’s surface, there are typically two or more lunar eclipses every year. Some are total, some are partial, some are a subtle kind of eclipse known as penumbral. During a lunar eclipse, a very small amount of light from the sun filters through Earth’s atmosphere onto Earth’s shadow on the moon. It’s why – at the middle part of a total lunar eclipse – the shadow on the moon looks reddish. 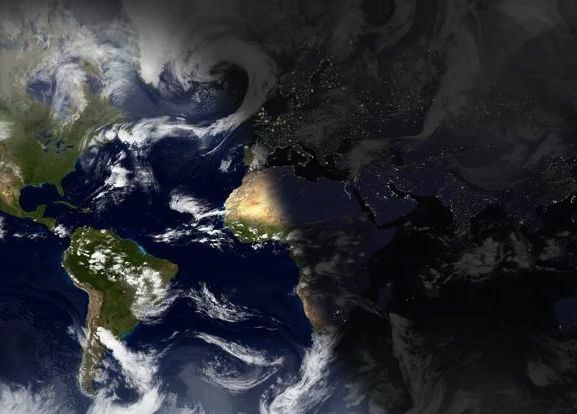 Another way to get an awareness of Earth’s shadow is simply to think about it as seen from space. 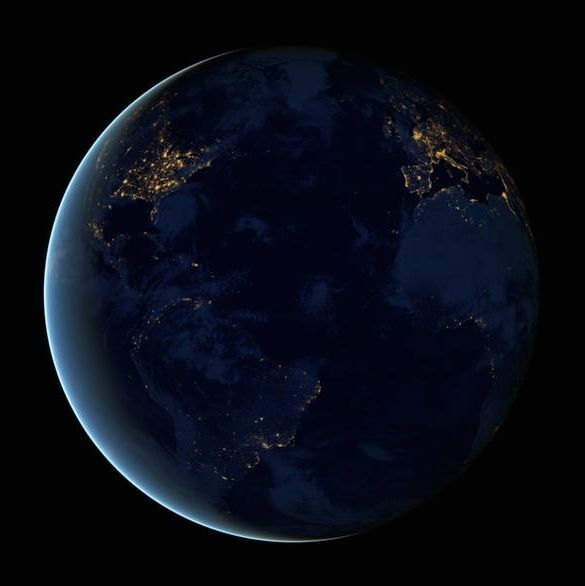 The image below provides a beautiful global view of Earth at night. It’s a composite image, assembled from data acquired by the Suomi National Polar-orbiting Partnership (Suomi NPP) satellite over nine days in April 2012 and 13 days in October 2012. The dark part is, of course, Earth’s shadow. Bottom line: You might see Earth’s shadow as an ascending line of darkness in the east just after sunset. Or you might see it brushing the moon’s face during a lunar eclipse. Or think about night as a shadow, when you’re standing outside in darkness after sunset … maybe tonight.